Just what we needed. A kooky celebrity imagining herself a ‘winemaker’ promoting her new wine label, The Keaton (duh), that’s made intentionally to be served on ice, “just the way she enjoys it.” WTF. Why do you even bother to drink wine? Come on. Who is she appealing to? My guess is to women she thinks might want to emulate her jejune style. I certainly hope she doesn’t fantasize that she’s the next ‘criminal’ booster of tasteless, lo-cal drinks. “The affordable line will be available in white and red”! Awesome. That reminds of a time I was in a restaurant, a shack really, outside of New Orleans – Mosca’s to be exact (read Calvin Trillin’s wonderful article about Mosca’s in The New Yorker) where the wine list was this: Red Wine, White Wine. 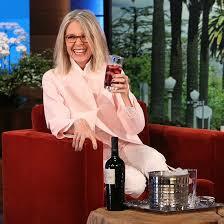 Thank you, Diane Keaton, for adding to the legions of lackluster alcoholic choices on the shelves of your local liquor store because no self-respecting wine store will carry this no matter whose name is on it. Gawd, I hope not.